I recently had the opportunity to interview the ultra-talented Captain John of Live Oac, and let me tell you, this blog has been one of my favorites to bring to you! Interviewing Captain John gave me an insight and a thirst to experience first-hand an adventure on the waters with him or one of the other well-qualified Live Oac boat captains. Growing up as a native to Hilton Head Island and the Lowcountry of South Carolina, you might think I am well-versed in fishing terminology and proficient wielding a fishing rod, but you’d be sadly mistaken. I can proudly claim I owned a yellow Snoopy fishing rod as a little girl. But I had a hang up with fishing. I would look at the wriggling fish that I was about to toss back into the water, and I’d grow sad. I pictured his little fish family desperately looking for him. This poor fish was now tragically separated from his loved ones, maybe forever. Thus ended my fishing days! I do love the smell of the salt water in the air, the sun rays glistening off of the water and the sound of water lapping against a pier or boat’s side. I don’t think there is much else more relaxing than that! Right? Hilton Head Island and the surrounding area is known for boasting many species of surf and sport fish. 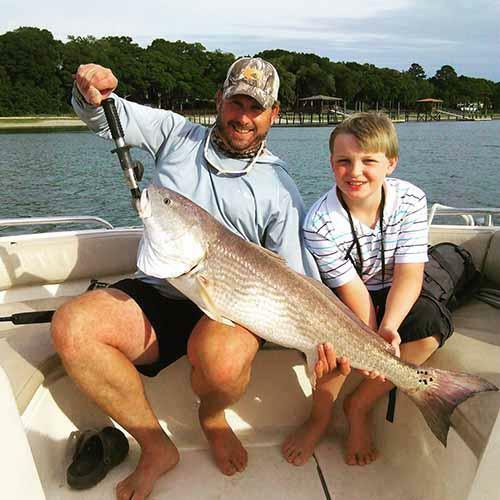 The recreational or avid sport fisherman can spend as little or much time fishing as he or she would like while on a Spinnaker Resorts Hilton Head vacation. I enlisted the help of a local charter boat fishing captain to tell us more about charter boat fishing in the Lowcountry. Meet John, Boat Captain for Live Oac. I did my research on Captain John courtesy of Trip Advisor Live Oac Reviews. 465 customers gave Live Oac an “excellent” rating! Now that’s highly impressive. Then I went on to see what was said specifically about Captain John. To quote reviewers, “Hilarious, courteous, kind”,”equal parts informative and FUN,” “extremely knowledgable,”a delight “perfect blend of guide,” “information giver and character,” and another spoke of Captain John’s “obvious love for his adopted home.” Next up, it was time to get to hear directly from Captain John of his love for the Lowcountry and what he does with Live Oac as a Boat Captain. Joy: Hi John, tell us how you got started as a captain of the high seas? John: As a young boy my Dad would take me fishing on weekends, (or whenever possible for that matter) on the waters of Upstate New York. It was a mutually loved hobby that not only produced lifetime memories, but also many lifetime lessons, which I am thankful for to this day. I began working Charter boats on Lake Ontario when I was only 13 and continued until my move to the Island nine years later. I fell in love with the South Carolina waters and all that they offer and to this day, 20 years later, remain surprised with what lies beneath. I became a guide in ’97, just prior to obtaining my Captains License for chartering here on the Island. Joy: I would imagine summertime is your busiest season with both vacationers and locals alike. How was last summer season for you? John: Summers seem to get better and better. At Live Oac, not only do we have a great team of Captains, that have been together a long time, but between any of the six of us, our guests are assured to get with someone who is locally experienced, and knows the “how-to’s and where-to’s” to assure a great fishing trip, no matter what Season. 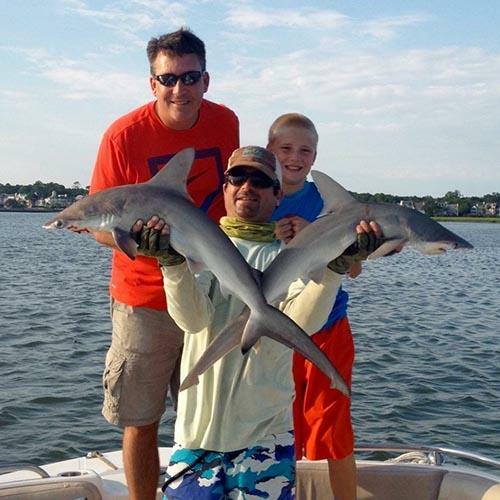 Our shark fishing charters have become increasingly popular summertime family bookings. The Red, Jack Crevalles, Spanish Mackerels, are out there too that time of year. Not to mention the sought out Tarpons for the avid anglers! Joy: Are there different fish that are targeted per season locally? Are some year-round or most seasonal? John: Most are seasonal. We do have fish that are here year round though, for example, our Spot tail Bass. Our guests, that over the years have become repeat guests, are well informed of what to expect and are included on all the vitals of their charter…i.e. Weather, tides, winds, possible sightings and “what fish are biting”‘ that time of year. Joy: What is your personal favorite season for fishing? Favorite type of fish to catch? Why? John: Well that’s a tough one.. I love wintertime fishing for the reds schooling in clear, cold waters. Spring waters are warm, and bring bait. In summer waters, the sharks are in and well – it’s summer on Hilton Head Island! Finally, fall waters are spectacular with the bull reds, sharks, and great weather, so I guess I would have to say fall. Joy: Of the different fishing adventures that Live Oac offers, which one would you recommend to a novice recreational fisherman? What about to the more serious sport fisherman? John: I would suggest for the “novice”, summertime Shark Fishing, where the bite is very active…and for the veteran Angler, targeting the Bull reds and Tarpon, I would recommend Fall. Joy: I’m sure you’ve had some amazing catches over the years. Tell us your most prized catch working as a sea captain with Live Oac and also your best catch this past summer. John: Well, there are far too many…. even for this past year alone…. From the Jack Cravelles that we caught unexpected in the summer, as we did with the Bull Reds that, should not have been there in July.., the unbelievable “fishing moments” that we have experienced, have a hard time topping one another! Joy: Are there any exciting new things in development with Live Oac that you can spill the beans about? We promise not to tell! John: This year, in addition to our fishing fleet, we have added two more flats boats that are designed to fish in our shallow inshore creeks. 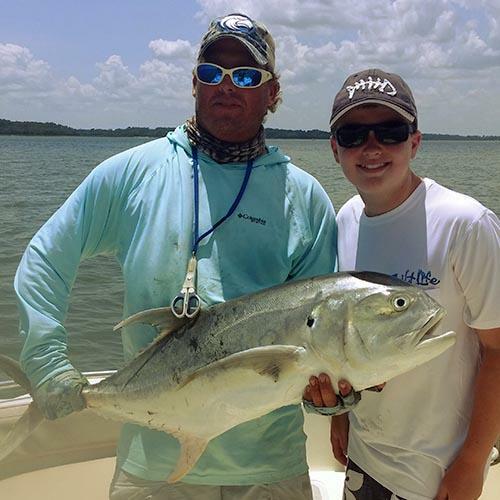 Joy: Well, John, thanks so much for taking some time to chat with me about the Hilton Head Island fishing experience our Spinnaker Resorts owners and guests can enjoy while on their next vacation. Any last thoughts or comments for my readers? John: Thank you for giving us an opportunity to tell you a little about ourselves and our company! No matter what your level of expertise may be – whether you’re a long time fishermen with a lot of experience or the first time novice that’s never been fishing, we have it covered for you. All our Captains want you to have the chance at the moments we have on a daily basis out on our beautiful waters. Here on our Lowcountry waters you can have experiences that will leave you with lifetime memories!